PNP Transistor – How Does It Work? The PNP transistor is a mystery to many. But it doesn’t have to be. If you want to design circuits with transistors, it’s really worth knowing about this type of transistor. For example: Want to automatically turn on a light when it gets dark? The PNP transistor will make this easy for you. In my article how transistors work, I explained how a standard NPN transistor works. If you haven’t already, I’d really urge you to read that article first. If you understand the NPN transistor, it will make it easier to understand the PNP transistor. They work pretty much in the same way, with one major difference: The currents in the PNP transistor flow in the opposite directions of the currents in the NPN transistor. Note: This topic is much easier with an understanding of current flow and voltages. A PNP transistor will “turn on” when you have a small current running from emitter to base of the transistor. 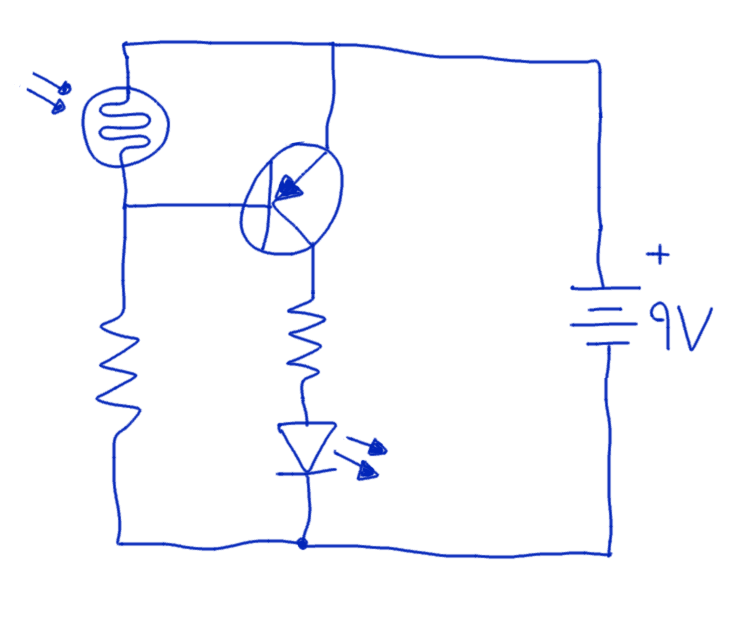 When I say “turn on”, I mean that the transistor will open up a channel between emitter and collector. And this channel can carry a much larger current. To get current running from emitter to base, you need a voltage difference of about 0.7V. Since the current goes from emitter to base, the base needs to be 0.7V lower than the emitter. By setting the base voltage of a PNP transistor to 0.7V lower than the emitter, you “turn the transistor on” and allow for current to flow from emitter to collector. I know this can sound a bit confusing, so read on to see how you can design a circuit with the PNP transistor. Let’s see how to create a simple PNP transistor circuit. With this circuit you can use to turn on an LED when it gets dark. First of all, to turn on the PNP transistor, you need the voltage on the base to be lower than the emitter. 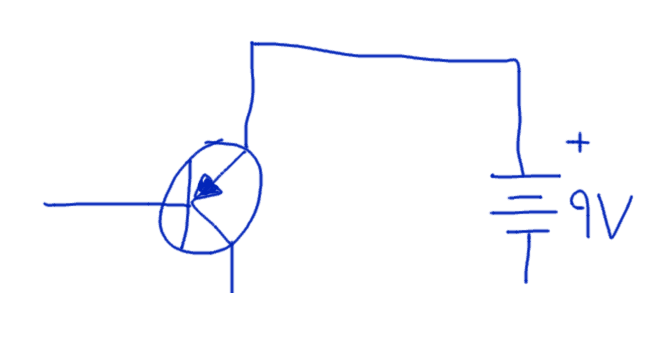 For a simple circuit like this, it’s common to connect the emitter to the plus from your power source. This way, you know what voltage you have on the emitter. 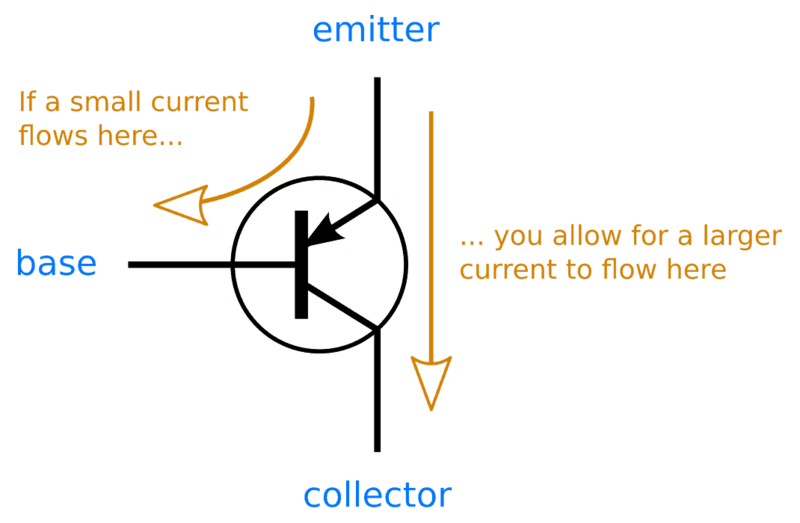 When the transistor turns on, the current can flow from the emitter to the collector. So, let’s connect what we want to control: An LED. Since an LED should always have a resistor in series with it, let’s add a resistor too. You can replace the LED and resistor with whatever you want to control. To turn on the LED, you need to turn on the transistor so that the channel from emitter to collector opens. To turn on the transistor you need to get the voltage on the base to be 0.7V lower than the emitter, which is 9V – 0.7V = 8.3V. For example, you can now make the LED turn on when it gets dark by using a photoresistor and a standard resistor set up as a voltage divider. The voltage on the base won’t behave exactly as the voltage divider formula tells you. This is because the transistor affects the voltage too. But in general, when the photoresistor value is large (no light present) the voltage will be close to 8.3V and the transistor is on (which turns on the LED). When the value of the photoresistor is low (a lot of light present) the voltage will be close to 9V and turn off the transistor (which turns off the LED). What Controls The Base Voltage? It’s partly because the emitter and base makes up a diode. And a diode always try to get its diode voltage over itself. This particular diode has a diode-voltage of about 0.7V. And 8.3V is 0.7V less than 9V. But, it’s also partly because the size of the photoresistor and resistor on the base sets up the voltage to be in the correct range. The transistor I used in this video is a BC557 PNP transistor. 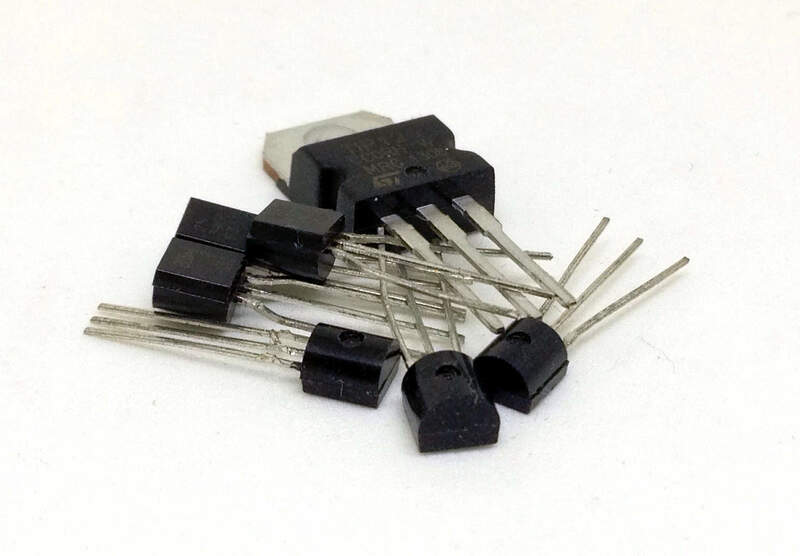 It’s one of the transistors that James Lewis recommends in his article on the best 4 transistors to keep in your parts kit. The photoresistor I used has about 10 kΩ when it’s light and 1 MΩ when it’s dark. The resistor on the base of the transistor is a 100 kΩ resistor. The LED is a standard output LED. And the resistor in series with the LED is a 470 Ω. If you have any questions or comments, let me know in the comment field below! But left an important resistor value. What could be the resistance value in series with the LED basically. The resistor in series with the LED is 470 Ohm. where do you find the value of a 100k ohms resistor? it’s possible only to work in saturation region? the goal is to have fully turn on or off the led. It turns fully on and off now. But are you looking for a sharper transition between on and off to avoid the half-on state? Thanks a lot for such tremendous effort in explaining such a difficult question in an easier way. My question is if we were to place a variable resistor in the circuit, where can we place it and why, because I’m always confuse by the way you place them I use to think that if it were to be placed then it should be placed immediately after the power source. Pls explain. Thanks a lot . I also want to ask now for example when the environment is semi dark the led might experience “on” and “off” rapidly due to fluctuation of the LDR and it happened at very high frequency which might damage the LEDs now what is the solution to this problem? The semi-off would dim the LED, not fluctuate. But if you somehow had a high-frequency signal and you want to fix the signal (instead of the source of the problem) then you can use a low-pass filter. Thank you for the knowledge. I would like you to explain saturation region one day. I did the Math. There is a problem. In the final circuit, we have a voltage divider on the left side consisting of a Photoresistor of two different values (Dark=10K; Light = 1M=1000K) and a normal 100K Resistor feeding the base of the PNP Transistor with the threshold voltage or 8.3 Volts which powers up the LED. In Light, the voltage is (100K/(100K+10K))*9 Volts = 900/110 Volts < 8.2 Volts < 8.3 Volt Threshold. In Dark, the voltage is (100K/(100K+1000K))*9 Volts = 900/1100 Volts < 0.82 Volts < 8.3 Volt Threshold. There is either a problem with my Math or your Circuit. Your circuit works according to your video. What did I do wrong? Actually, the voltage on the base won’t behave exactly as the voltage divider formula tells you. This is because the transistor affects the voltage too. The part between the emitter and the base of the transistor behaves as a diode of 0.7V. A diode has internal resistance that varies depending on the current and/or voltage through it. So, for this type of circuit – it makes more sense to make a simplified calculation like you did above to make a first guess of the correct resistor value. Then test it in real life and adjust the value according to your needs. Just the same, I’d be happier with a 120 Kohm Resistor, which will make the Math work out better, but there is nothing wrong with your pragmatism. It occurs to me that if I take your last diagram of the Night light Circuit and replace the LED with the Transistor Blink LED Circuit from http://www.build-electronic-circuits.com/simple-electronic-circuits/#more-909 , that I would have a blinking Night Light. This brings about a few problems, i.e, making the Math work out for the flashing lights. Firstly, how much power does the flashing light component need? Second, how much power can the Transistor Switch deliver? Third, how much power does it take to power the circuit? Finally, since I’d like to power it through an Adapter on a Wall Socket, what is the power I need and what interface can I use to deliver that power? Please ignore. I found an improvement! I would like to build a circuit similar, but with a thermistor, and different LED lights for various temperatures. I believe this could be accomplished using PNP’s. Have you made a temp controlled LED’s? I haven’t made that with PNP’s. Only with a microcontroller. Let me know how it goes! I tried the Night Light Circuit. I substituted a 2N4401 Transistor for the BC557 and weird things happened! It behaved properly only when the Photo-resistor and the 100K Ohm Resistor switched places and it did not matter if the 2N4401 was in backwards or not. Light turned off the Circuit and Darkness turned it on! If I assembled the circuit as diagrammed, Light turned on the Circuit and Darkness turned it off. OK, I used the wrong type of Transistor. No wonder it was backwards. According to http://alltransistors.com/ , there are at least 91182 transistors. How do I navigate through this maze and fin the one most suited for a given application? Start with a standard one that you are familiar with. If this for some reason will not work for your circuit, find one that will. For example if you have a problem with the BC546 does not conduct enough current, find one that can handle more current. If it’s too slow, find a faster one. Etc…. Like I said, how??? What am I looking for? 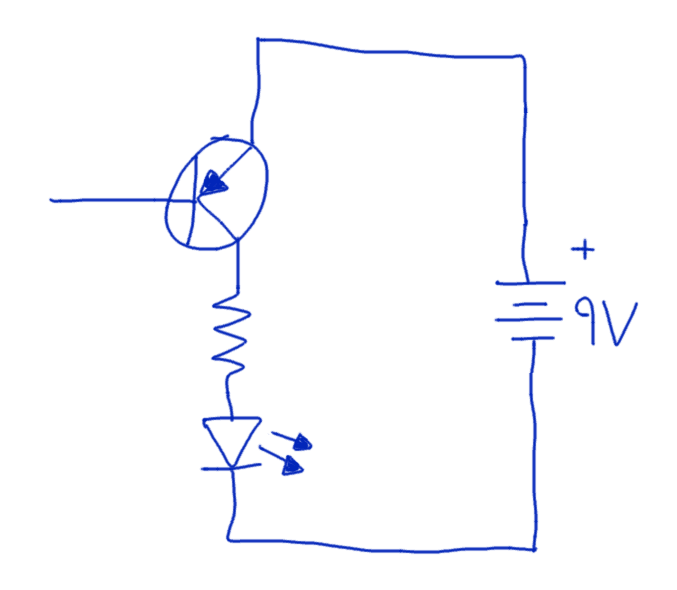 In your circuit, does the transistor will turn on when voltage on the base is exactly 8.3V ? Exactly no. But around 8.3V. Acturely, you guys you know much about Electronics .How can I make it to be like you guys, am A-level student in Tanzania taking physics,chemistry,biology and basic applied mathematics. I have a 24vdc tyco smoke detecor & i need to enegize a 24vdc relay when smoke is detected. Can you describe the needed circuit & components please. Hi, sorry I’m not familiar with your smoke detector. Hi. for the Photosensor/LED cct, let say the photosensor is not there. Base only has resistor to pull to ground. if I measure the voltage at Base line, I should get 8.3V. Right? Hello how this circuit can behaves opposite, ie led to be off during darkness? What are some common examples of when you’d want to design a circuit using a PNP BJT instead of choosing a NPN? I tried to sift through all the comments to see if anyone hd asked this already but after a while, I decided to just go ahead and ask it myself. That is A LOT of comments.